Neil and Joanne Anderson's bestselling 365-day devotional is now available. Daily in Christ puts a spark into devotional readings and quiet times with its emphasis on a believer's identity in Christ. ^now available in trade paper. Daily in^Christ puts a spark into devotional readings and quiet times with its^emphasis on a believer’s identity in Christ. Dr. Neil T. Anderson is the founder and president emeritus of Freedom in Christ Ministries, which has offices in Canada, United Kingdom, Switzerland, India, Australia, New Zealand, Africa, and throughout the United States. He conducts conferences for Christian leaders around the world in addition to maintaining a heavy writing schedule. Neil stays involved with the academic community by teaching Doctor of Ministry classes at several seminaries. He enjoys golf, bike riding, traveling, family, and being a grandparent. 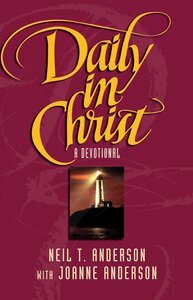 Customer Reviews For "Daily in Christ"
Every devotion in this book is practical, honest and goes to the heart of many of our modern problems, worries and questions. It gets to the root cause of so many of our guilt based feelings that stop us going deeper with God. I have given 6 copies of this book to different types of people, and every single one of them raves about how life changing it has been. I urge you to get this book and read it each day. I am convinced it will change your outlook on life! Having this book on your desk at work, or at home is just what the doctor ordered. It is short, sweet to the point, with honesty, integrity and just a blessing. As for a non reader of "Daily Devotions Books" this was a first, but also because I read so many of his other books, which was life altering. Every one I introduce it too, agrees. Great gift idea.